This package teaches English vocabulary in an enjoyable, yet very effective way. It consists of a series of picture games. There are 78 sets of words and pictures included, and instructions are given for creating your own sets. The words are heard spoken along with the pictures. The 78 topics include animals, food and drink, clothes, occupations, leisure activities, travel, household objects, school, numbers, parts of the body, weather, verbs, adjectives, prepositions and many more. The first four games - Fastfinger, Three in a Row, Matchmaker and Guess what! - are for two people playing against each other, or one person playing against the computer with a choice of three difficulty levels. The user chooses a topic from the 78 offered. 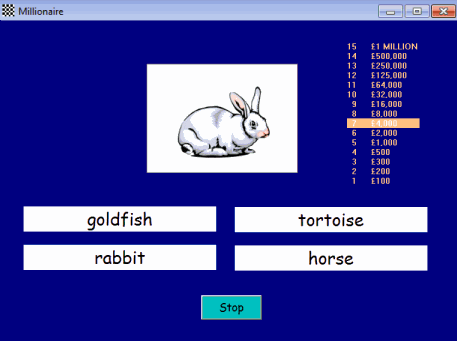 The remaining three games - Millionaire, Hangman, and Jigsaw - are for one player only and operate using words selected from any of the 78 sets. Players choose a letter key on the computer keyboard. Each player starts with 25 points. Every time one of the pictures changes, one point is taken off one of the players' scores and put into a pot. When two pictures match, the first player to press his chosen key wins the points in the pot. The winner of the game is the player to take all 50 points. The speed of the game can be varied to suit different abilities. Nine pictures are displayed in three rows of three. 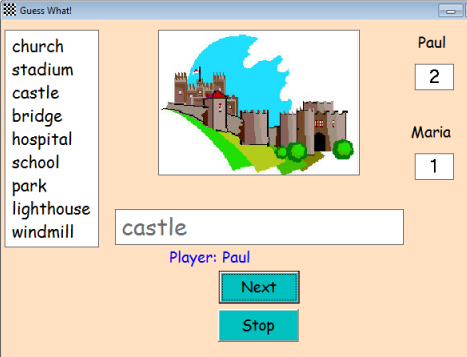 Players take turns to choose one of the pictures by clicking on the correct word underneath. The object of the game is to have three squares in your own colour across, down or diagonally and, of course, to stop your opponent doing the same. Eighteen boxes conceal nine pairs of pictures. Players take turns to view the contents of any two boxes by clicking on them. If the two boxes contain matching pictures, that player wins those boxes and has another go. The skill is to remember where the pictures are. When all of the boxes have been won, the player with the most boxes is the winner. The nine pictures are put in a random order by the computer. Players take turns to guess which picture is next, typing the word underneath. One point is given for each correct guess, and that picture is not used again. The winner is the player who has the most points when all of the pictures have been guessed. The skill is in remembering the order of the pictures and which ones have already been guessed. The computer selects pictures at random from the 78 topics. With each picture you are given a choice of four words, all from that topic. Click on the correct word to win the money. Answer all fifteen questions correctly to win a million pounds - only pretend! In this version of the traditional Hangman game, the computer selects words from any of the 78 topics. Try to guess what the picture is with as few pieces of the puzzle in place as possible. Learn new words from pictures before you start playing a game.